Surface Area: 9,200 sq. ft. When contracting for an International Standard Model Home and the requirement is for it to be a Zero Net Energy home, it is all about the building envelope. The application of Spray Poly-Urethane completes the building envelope at the roof line. The Department of Energy estimates that as much as 40% of a homes energy loss is created as result of energy loss through walls, ceiling, roof and exterior elements such as poorly sealed windows. 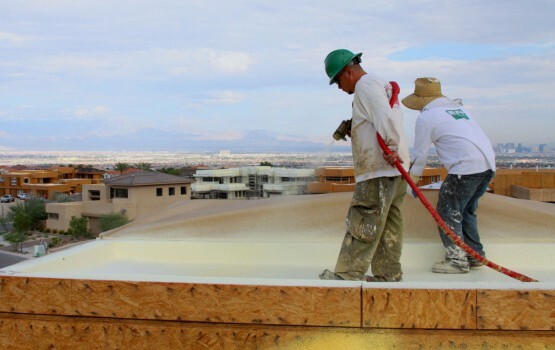 The foam roof contributes the greatest amount of energy savings possible in LAS VEGAS desert because not only does it seal 100% of the joints in the plywood and pipes and roof jacks at the roof line, thus eliminating energy loss through infiltration and ex-filtration of conditioned air, it also has a reflectivity of over 78% reducing radiant heat absorption into the structure. At 3 inches thick, it is providing an additional insulation value of R-21 and combining that with the air barrier design and the reflectivity it is providing an effective R-value of over 28 to the homes thermal protection. The other element of advanced design for a New American Home is sustainability. Poly-Urethane Foam is the only sustainable roof system on the market. While other roof systems have a finite life cycle and will require replacement at end of its serviceable life, the Poly-Urethane Foam roof can be 100% renewed with an application of fresh UV protecting coating along with some minor service. 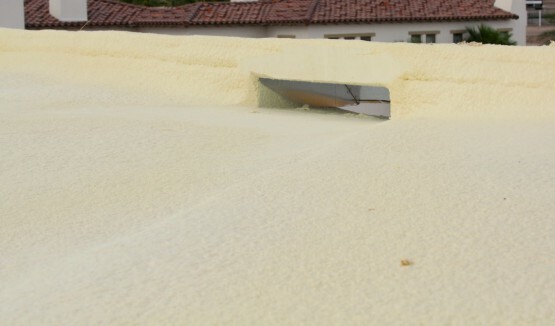 A Poly-Urethane Foam roof will last as long as the home stands. It is a lifetime roof system. 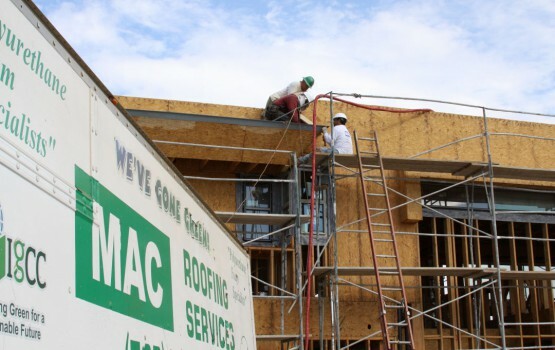 Between 2008 and 2012, MAC Roofing Services was the contractor of record on 4 New American Homes. Three of these models for the International Builders Show in Las Vegas were contracted by Blue Heron Homes and one was contracted by Element Builders. To view these impressive modern homes and see the roof via sky-decks, go to Marquis 7-Hills and to Sky-Terrace in Green Valley Ranch. Since the first of these homes was constructed in 2008 for Blue Heron Homes, through 2015, MAC Roofing has installed Spray Foam Roofing on more than 14 million feet of roof area in Las Vega and more than 30 million feet of foam roofing and coatings since 1996. This makes MAC Roofing the undeniable leader in Green Roof construction in Nevada. and your first choice for sustainable roof construction.